Synthetic peptide corresponding to Parainfluenza virus 5 V5 tag aa 50-150 conjugated to keyhole limpet haemocyanin. E. coli Positive Control (Escherichia coli ) Whole Cell Lysate (ab5395) can be used as a positive control in WB. 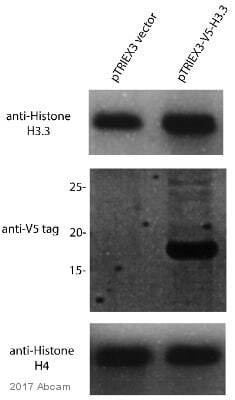 This antibody gave a positive signal in Western Blot when tested against a V5-tagged protein. Our Abpromise guarantee covers the use of ab15828 in the following tested applications. ChIP Use at an assay dependent dilution. ChIP was performed with 25 ug chromatin, 5ug of antibody and 20 ul of Protein A/G beads. WB Use a concentration of 0.5 µg/ml. A stably transfected 293T human cell line harbouring the GAL4 upstream activation sequence was transiently transfected with a V5 or T7- tagged GAL4 DNA Binding Domain construct. 48 hours post transfection Chromatin was prepared according to the Abcam X-ChIP protocol. The ChIP was performed with 25 ug chromatin, 5ug of antibody and 20 ul of Protein A/G beads. A non-specific antibody was used as the negative control. The immunoprecipitated DNA was quantified by real time PCR (SYBR Green approach). Publishing research using ab15828? Please let us know so that we can cite the reference in this datasheet. How many V5 epitope tags does the vector express that was used in the ChIP experiments posted on the online product datasheet? This is the experiment with anti-GAL4, anti-V5 tag and Non-specific antibody on X-axis. I'm sorry but there is no information available regarding how many V5 tags were incorporated into this GAL4 fusion protein. Please contact us againif you have any further questions. The scientist who may have further information regarding the number of V5 tags on the vector is out of town until next Monday. I will follow up with you early next week. Thanks for your patience! Please feel free to contact me if you have any further questions. I would like to reassure you that both antibodies are tested and guaranteed for CHIP. I can confirm that ab15828 was tested by our lab in house for CHIP and therefore I would recommend to use this antibody. If you find the publications for ab9116 more convincing, I would like to confirm again that this antibody is also guaranteed for CHIP by our Abpromise. ab15828 has more than one CHIP publication and therefore we believe that it is also valuable information if a publication states that this antibody can be used as a negative control for other antibodies. Would it be possible to receive item ab15828 (Anti-V5 tag antibody - ChIP Grade) as a replacement for the previously ordered antibody. I am sorry this product did not perform as stated on the datasheet and for the inconvenience this has caused. As requested, I have issued a free of charge replacement for one vial of ab15828. To check the status of the order please contact our Customer Service team and reference this number. Please note that this free of charge replacement vial is also covered by our Abpromise guarantee. Should you still be experiencing difficulties, or if you have any further questions, please do not hesitate to let us know. I wish you the best of luck with your research. Thank you for letting me know the progress. It does look like the expression in the HeLa cell line is significantly better and the background staining does appear to have been reduced considerably. I can however understand your concern in continuing to perform ChIP. I think it would be worthwhile to perform a "no primary" control to check the specificity of the secondary antibody if this has not been done already. Is the same anti-rabbit secondary antibody being used for the detection of ab15828 as well as the Sigma antibody? The strong non-specific bands at 40, 45 and 60 kDa as well as the weak non-specific band at 30 kDa appear to be present in both blots and may therefore be as a result of the secondary antibody. This non-specificity could be reduced by the addition of Tween to the dilution buffers as well as the blocking buffer used, and reducing the concentration of the secondary antibody used. I would also suggest now that you are seeing a strong signal, reducing the amount of lysate loaded to 10 µg per well and increasing the dilution of the antibody to 0.25 µg /ml as well as attempting the incubation at 4°C overnight instead of 1 hour at room temperature. This may again increase the specificity seen further. However, if you do not think the secondary antibody could be contributing to the non-specificity seen I can suggest an alternative as a replacement, ab9116. This antibody has also been used for ChIP with V5. More information can be found from the following reference: Jagani Z et al. Loss of the tumor suppressor Snf5 leads to aberrant activation of the Hedgehog-Gli pathway. Nat Med : (2010). PubMed: 21076395 If this alternative is not suitable I can also offer a refund. I look forward to hearing your thoughts. As far as I could tell, expression in HeLa cells should not be a problem with the CMV promoter so if you still get the same results after trying this get back to me and we'll discuss what the next course of action is (refund/alternative antibody). I hope it goes well. Thank you for taking time to complete our questionnaire. The details provided will enable us to investigate this case and will provide us with vital information for monitoring product quality. Having reviewed this case, I would like to offer some suggestions to help understand the problems encountered with ab15828. I would also appreciate if you can confirm some further details. I understand you are expressing the protein from pcDNA transfection of 3T3 cells and that purification of hMsl1 from HeLa cells has been performed. Has a similar purification of the Msl1-V5 fusion also been purified? It seems both the Sigma antibody and the one from Abcam are struggling to pick out the band expected at ~80kDa. I am just wondering if this is because the expression levels are very low. This is supported by the fact you had to perform imaging using the Kodak BioMax film and the difference between the positive and negative expression seems weak. If this is the case, it could be confirmed by using the purified protein (if you have any), to test both antibodies, as well as quantifying the level of expression in the 3T3 cells by comparison with the known quantity of fusion protein. May I ask which pcDNA construct you have used? This can have a significant effect on the expression levels from cell line to cell line (Invitrogen reported barely discernible expression with CMV (pTracer) promoter in 3T3 cell line). It may be beneficial to try the same experiment that you have performed but with HeLa cells transfected. I would also suggest carrying out a no primary control, to find out how much of the non-specificity is due to the secondary antibody. Trying an alternative blocking agent (eg milk), adding a mild detergent such as Tween 20 (0.2%) as well as incubating with the primary antibody overnight at 4 degrees may also provide cleaner results. Should the suggestions not improve the results, please do let me know. In the event that a product is not functioning in the species and applications cited on the product datasheet (and the problem has been reported within 6 months of purchase), we would be pleased to provide a free of charge replacement (with a different batch of this antibody, or with an alternative antibody such as ab27671), credit note, or refund. I hope this information is helpful, and I thank you for your cooperation. ChIP grade antibody ab15828 used in mouse sampled with transient transfection of V5. Both control and transfected samples show non-specific bands. Thank you for contacting us. I am sorry to hear you are experiencing difficulties with one of our products. We take product complaints very seriously, and investigate every product that we feel may not be performing correctly. As discussed, I am attaching our questionnaire so that I can gather further information regarding the samples tested and the protocol used. Once I have received the completed questionnaire, I will look at the protocol and see if there are any suggestions I can make that may improve the results. As discussed, attaching the file of the Western blot image would be very helpful. This information will also allow us to investigate this case internally and initiate additional testing where necessary. If the product was purchased in the last six months and is being used according to our Abpromise, I would be happy to replace or refund the antibody. I look forward to receiving your reply.